Mikayla Brabant stood proud on top of the podium at The Royal West, making her the inaugural national finalist winner of the J.C. Anderson Legacy Medal. After two days of top-level competition, Brabant and her horse, Cortofino, ended up on top. “I’ve had [Cortofino] since he was five and he’s the best horse I have ever ridden,” said Brabant, “he is my baby – I love him so much!” The silver medal was awarded to Austin Krawitt who piloted, the Hanoverian gelding, Scirocco 91 and bronze to Shaelynn Enders with Princessa. 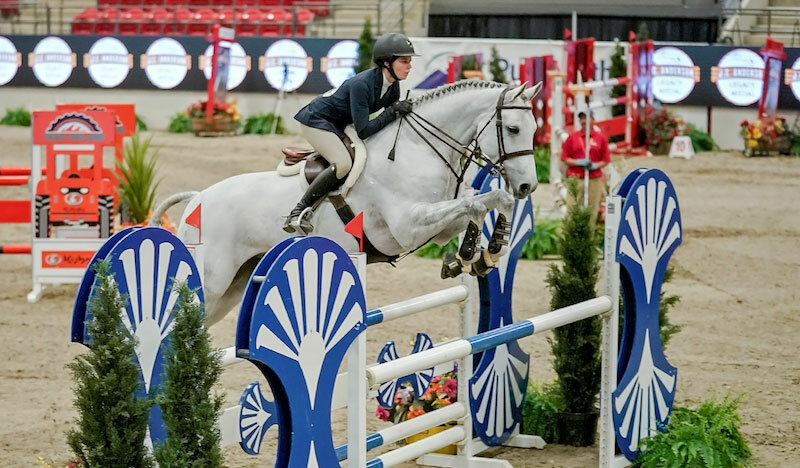 “It is essential in becoming a top rider,” said the newly crowned winner, Brabant, “I have really realized since I started doing the equitation I have become more consistent – even in my jumpers – which has made me much more successful”. The ride-off of the J.C. Anderson Legacy Medal consisted of a horse swap between the top four riders. Shaelynn Enders, Mikayla Brabant, Anya Bereznicki and Austin Krawitt were presented with this challenging task. Enders and Cortofino were the first to take the course, “there is a big difference between our two horses. [Princessa] is hot, bouncing and exciting were as [Cortofino] is laidback and easygoing – Mikayla has a great horse”. Brabant stood third after the second round and laid down an effortless ride-off aboard Princessa, which moved her into first. Finally, Krawitt and East took the course moving them into second overall. The first J.C. Anderson Legacy Medal National Finals brought riders from the East and West. “If we are going to build our sport and have top riders representing [Canada] at the Olympic games and championships – it’s really important to develop the basics,” said John Anderson, “The J.C. Anderson Legacy Medal is the opportunity for the young athletes to fine tune their skills and be rewarded for their efforts.” Generous Athlete Development Bursaries were awarded to the top five riders as well as Travel Bursaries to the top 12 to assist these promising young riders.